Be warned, this is Greek tragedy and there be death and blood ahead. Lots and lots of blood. Welcome to Antigone, showing at the National Theatre. Sure, this is a modern retelling of sorts, but that doesn’t mean any of the death and blood are lessened. Antigone tells the story of the titular character, who disobeys her uncle Creon’s law and buries her brother. In return Creon sentences her to death, and although any number of people tell him to back down – including the blind prophet Teiresias – he refuses to do so. 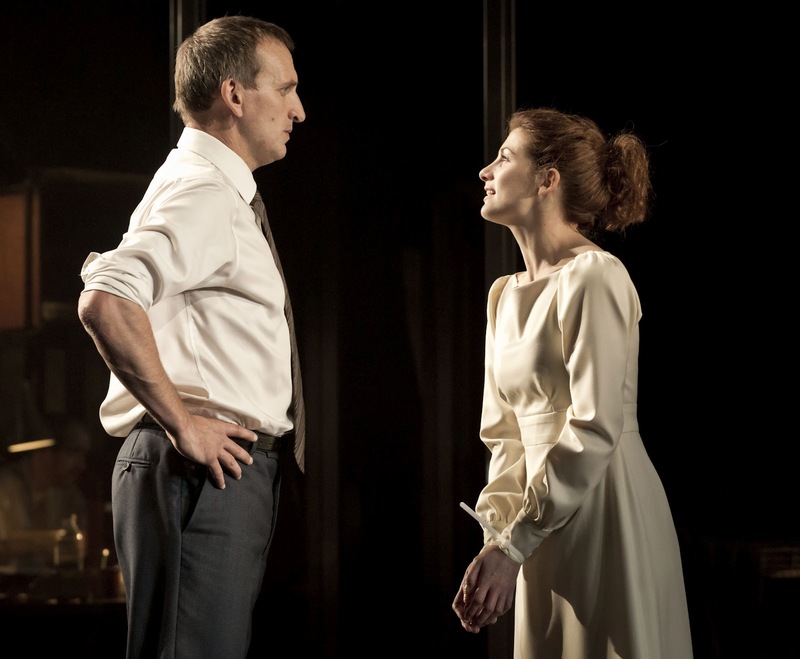 The play belongs to Christopher Eccleston as Creon, who we see turn from an honourable leader (of sorts) to a tyrant to a broken man (covered in blood) in the space of 90 minutes. The play opens with a stunning reference to one of the most famous political photographs of the last few years, as the characters recreate the image of President Obama and Hillary Clinton watching the capture and killing of Osama Bin Laden. And the opening signifies the tune of the rest of the play. Yes, this is Sophocles’ Antigone, but Don Taylor wants to make it clear in his version that all the things Sophocles wrote about thousands of years ago are still relevant today, and the play is used as a comment on modern society. So there are plenty of references to terrorism, and a clear argument about who in the play is a terrorist. Is it Antigone, who disobeys the laws of the land? Or is it Creon, the leader who abuses his power and can’t see the woods for the trees? And there is also much made of the role of women in society. Creon underestimates Antigone, dismissing her as a woman who would not be brave enough to disobey his word, only believing she has committed a crime when the evidence becomes too much. Ismene, Antigone’s sister, while not directly taking part in the act, stands up to her uncle, surprising him. And after years of being useful only for bearing children, sending sandwiches for lunch and making sure Creon’s tie is straight and his suit jacket unrumpled, Creon’s wife Eurydice proves that her role as mother is perhaps more important than any other relationship in the play. It is only when she kills herself out of grief that Creon realises the women in his life should have been more valued, and he shouldn’t have underestimated them. The women actors are all strong, even as their characters sometimes wither under the command of the men. Also good is Luke Newberry as Haemon, Creon and Eurydice’s son, who commits suicide after finding Antigone has hanged herself in the cave where she was banished to die by Creon. Although Haemon initially comes across as a bit of a drip, he grows stronger in a scene where he tells his father how the people feel about Antigone’s sentence. In one of the few, if not only, comic interludes in the play, Haemon proceeds to disguise his own thoughts as those of others, providing an interesting back and forth between him and Creon. And while the exchange is humourous, it masks a very, very serious opinion – that everyone thinks Creon is wrong to sentence Antigone to death just for caring about her brother. It’s a play partially about power, and how it changes people. It clearly changes Creon, and it changes those around him, who are too afraid to stand up for what is right in the face of his power, at least not until it’s too late. 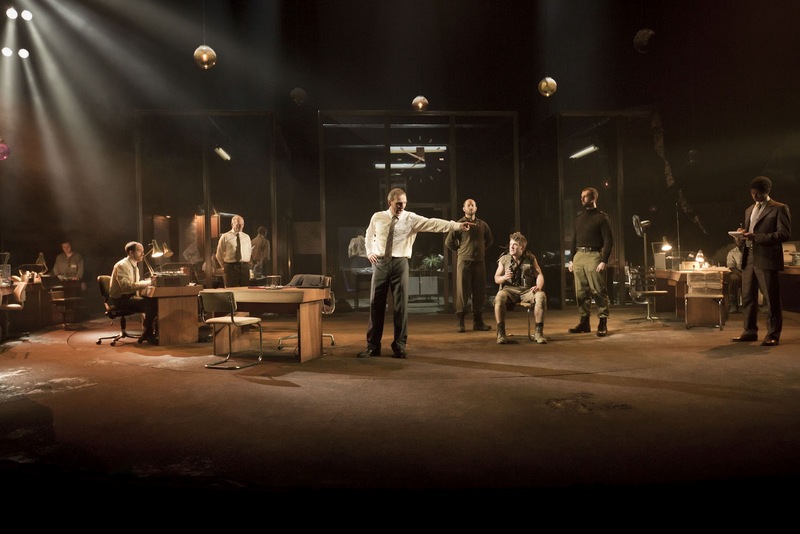 The set for Antigone – a revolving office suite – is used brilliantly. Three offices are marked out with glass, reflecting back the actions of those at the front of the stage, which is set out like an open plan office. The glass means it’s possible to see all the action going on, even those seemingly innocuous moments, like Creon’s portrait being put up when he becomes king (look for that portrait at the end). Movement and music are used to great effect throughout. There are a number of scenes during which all the characters move at the same time, and then stop at the same moments. It’s the little touches that are really noticeable – two characters lifting cups of coffee at the same time, the placing of chairs after each movement. This isn’t just acting, it’s also dance. To book tickets for Antigone at the National Theatre, click here. Next Post Album review: Introduction by It Boys!